"The Lost Road" redirects here. For the 1913 collection of war stories The Lost Road and Other Stories, see Richard Harding Davis. The Early History of the Legend — an introduction to the following two pieces, detailing how Tolkien's correspondence with C. S. Lewis led to the writing of The Lost Road. The Lost Road — a story written in late 1936 that connects Tolkien's other tales to the 20th century. Herein are collected the oldest Tale of the Downfall of Númenor, the story of the Lost Road into the West, the Annals of Valinor and the Annals of Beleriand in a later form, the Ainulindalë, or the Music of the Ainur, the Lhammas, or Account of tongues, the Quenta Silmarillion or History of the Silmarils and the history of many words and names. 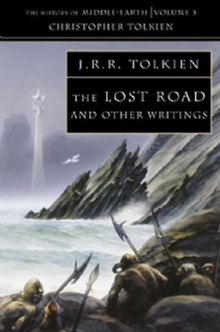 The Lost Road itself was the result of a deal between Tolkien and C. S. Lewis, where they agreed to an attempt at writing science fiction. Lewis ended up with writing a story about space travel, which would become The Space Trilogy, and Tolkien would try to write something about time travel, but he never completed it. It is just a fragmentary beginning of a tale, including a rough structure and several chunks of narrative, including four entire chapters dealing with modern England and Númenor, from which the entire story as it should have been can be glimpsed. The scheme was of time-travel by means of 'vision' or being mentally inserted into what had been, so as to actually re-experience that which had happened. In this way the tale links first to Saxon England of Alfred the Great, then to the Lombard king Alboin of St. Benedict's time, the Baltic Sea during the Viking Age, Ireland at the time of the Tuatha Dé Danann's coming (600 years after The Flood), prehistoric North in the Ice Age, a 'Galdor story' of Third Age Middle-earth, and finally the Fall of Gil-galad, before recounting the prime legend of the Downfall of Númenor (an Atlantis like tale) and the Bending of the World. It explores the theme of a 'straight road' into the West, now only in memory because the world is round. Tolkien reworked and expanded some of the ideas in The Lost Road in The Notion Club Papers, which was also left unfinished. This page was last edited on 7 March 2019, at 18:27 (UTC).